After SRS Crisafulli personnel trained Lion Oil staff to operate the dredge and helped put the Rotomite-SD110 into operation, Jeff McGriff wrote SRS Crisafulli’s Sales Manager the testimonial shown above. Application. A domestic copper mine with a tailings dam that overflowed onto adjacent forest service land had constructed a new dam to hold additional tailings. The customer needed an immediate solution to the overflow problem to avoid fines. Because the encroachment area was odd shaped with an uneven bottom and some very shallow points, we recommended Crisafulli’s aluminum hull, self-propelled, shallow draft dredge, the Rotomite SD-110. Composition of dredged material. The tailing material was comprised of 31% sand, 59% silt and clay, and 10% gravel, with a PH level of 8.5-11 due to lime treatment to enhance the copper floatation process. Functioning of Rotomite-SD110. The Rotomite SD-110 was placed in the tailings encroachment area to dredge and pump tailings over the new dam’s 15’ wall. The dredged slurry was then pumped 900’ to disposal sites. Tailing material ranged in depth from a foot to more than 30 feet. The self-propelled, shallow draft dredge’s ability to maneuver throughout the encroachment area was key due to the area’s terrain and varying water depths, since it was necessary to keep water levels from rising to avoid further encroachment of the slurry onto adjacent forest service land. Dredge operators were able to move the dredge around with minimum effort and continue dredging as water levels varied. Results. The customer was very happy with the performance of the Crisafulli Rotomite-SD110 dredge. The customer removed 100,000 cubic yards of dredged solids from the encroachment area in a little over 3 months, achieving the customer’s goal in less time than was budgeted. Photo of Rotomite-SD110 in Factory. After a year of close collaboration with the prospective customer, SRS Crisafulli built and shipped a Rotomite SD-110 shallow draft dredge to an Asian customer in 2013. Three international firms played key roles to close the deal including SRS Crisafulli’s authorized International Factory Representative. The prospective customer needed to remove sediment at its Treatment Plant. Sediment-bearing water from a regional dam and river traveled more than 30 kilometers to the Plant. The river also carried silt to the treatment Plant where sludge was collected at the bottom of sedimentation basins. To achieve acceptable, sustained settled water quality, to preserve basin capacity, and to comply with environmental regulations, the Plant needed to clean its sedimentation basins twice a year. SRS Crisafulli provided detailed product specifications and capabilities for the Rotomite SD-110 dredge, and defined what made the Rotomite SD-110 a superior dredge for the application. After SRS Crisafulli satisfactorily answering all the requests, the customer purchased the Rotomite SD-110. The Rotomite SD-110 equipment package provided a high-performing dredge pump able to move 1500 gpm at 80 ft. TDH in water. The cutterhead was 90-inches wide with a 15-inch pump opening for high sludge production. A unique hydraulic thruster enabled the dredge to be driven like a boat. 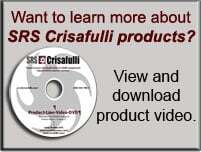 Pursuant to SRS Crisafulli’s superior worldwide service, a SRS Crisafulli Factory-trained engineer travelled to Asia to support the installation and to commission the Rotomite SD-110 dredge. 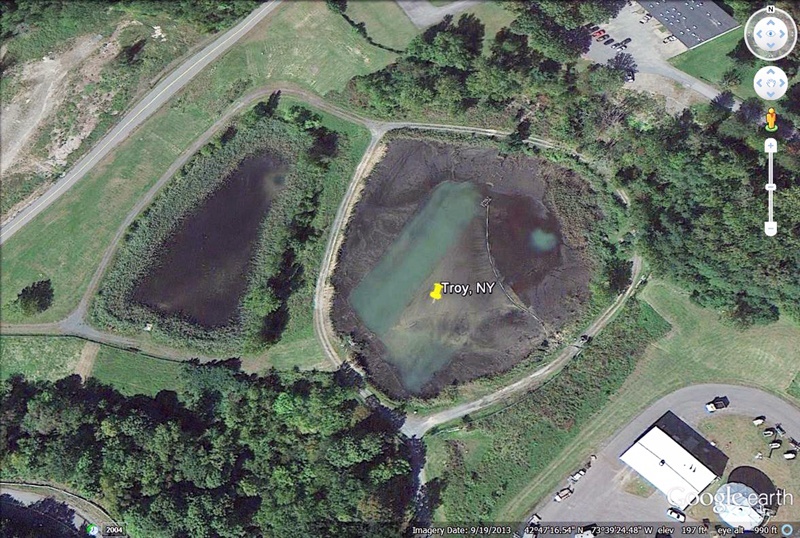 Case History Application – Municipal Water Treatment Facility, City of Troy, NY. The City of Troy, New York purchased a SRS Crisafulli FLUMP in 1991, and a second Crisafulli dredge, the Rotomite-SD110, in 2014. The FLUMP is a 40 HP, 4” model with wheels attached to the pontoons for easy transport around the facility. The Troy water treatment facility has two lagoons. The FLUMP is in the lagoon closest to the storage tank (See photo). The second lagoon is further down the hill, is irregularly shaped and its water level fluctuates greatly. SRS Crisafulli built a 4” J-Series artisan pump to achieve 800 GPM at 120’ TDH, which is a higher head capability than Troy’s FLUMP, and is able to maneuver around the upper pond without a cable traverse system. The application was to remove sludge from the upper lagoon and pump it to a tank for dewatering using a press. As the capacity of the plant increased, the FLUMP and press could not keep up with the sludge accumulation. The FLUMP maintains the tank’s water capacity and the Rotomite fills geotubes, which enable dried solids to be removed for disposal. The Rotomite’s variable speed pump maintains a consistent flow of slurry into the geotubes. With the two dredges, the City can keep its two lagoons cleaned and sustain the required drinking water capacity. Application. Remove silt, sand, and sediment from 74 boat slips in a private marina. Special problems: Avoid disturbing the docks, and avoid obstacles. Dredging takes place in a saltwater tidal environment. Additional purpose: Meet EPA cleanup requirements. Operator’s station with custom ergonomic realignment of controls; Dredge sludge pump volute/case constructed of chrome carbide overlay plate; Cathodic protection (Zinc Anodes) and a rust preventative coating beneath the dredge’s epoxy paint; All fittings of stainless steel and/or aluminum to resist corrosion; Unit coated with Amerlock 400 (base coat) and Amercoat (top coat); Cutterhead shroud and drive couplers are stainless steel; auger tube, motors and tines in steel coated with Amerlock 400 and Amercoat; Sound reducing panels with a target of 87 dB or less from 200 feet distance; Set up for traverse winch were guides at the end of the platform; A belly pan below the platform/ engine compartment to prevent saltwater contact with the diesel engine. 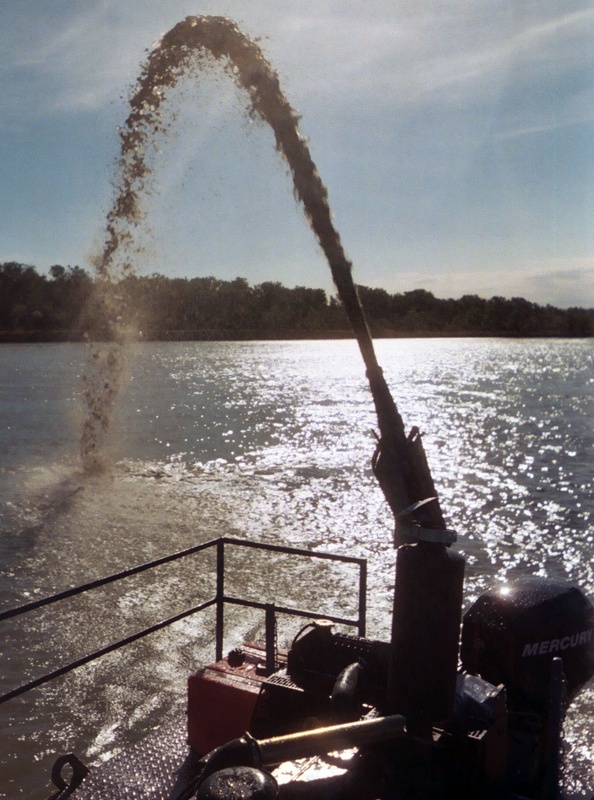 Photo below, Rotomite-SD110 "spouting" - i.e., side-casting dredged slurry. Solution. In 2006, the Richland and Roosevelt County Conservation Districts acquired a Rotomite-SD110 dredge from SRS Crisafulli. The decision enabled irrigators with property along the Missouri River from Fort Peck to the border, as well as irrigators who worked stretches of the Yellowstone River that flow through Richland County, to use a modern, environmentally friendly method to access the water. 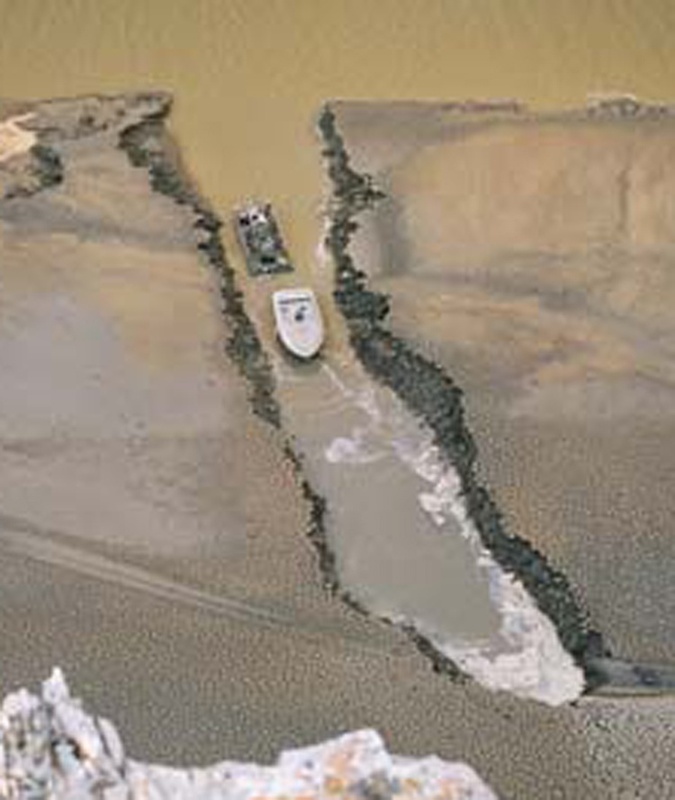 Photo below shows channel dug by Rotomite-SD110 through the mud of the Missouri River to "rescue" a boat locked in the mud.